Sooner or later, each of us must face the day we develop a disturbing new interest in lawn care; the day we order sauvignon blanc instead of Rolling Rock; the day we refuse to see any concert where we cannot sit down. Sooner or later, each of us must face the day we turn uncool. 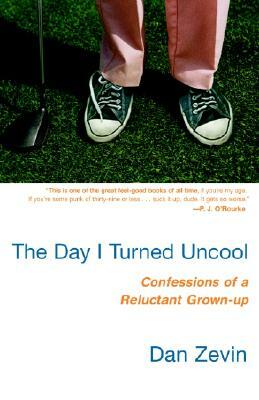 Dan Zevin, who “was never exactly Fonz-like to begin with,” is having a hilariously hard time moving from his twenties to his thirties, and he confesses everything in these comic not-coming-of-age tales. As he shamefully employs his first cleaning lady, becomes abnormally attached to his dog, and commits flagrant acts of home improvement, Dan’s headed for an early midlife crisis—and a better-late-than-never revelation: Growing up is really nothing to be reluctant about. In fact, it’s very cool.